British astronomer and broadcaster Sir Patrick Moore has died, aged 89, his friends and colleagues have said. He “passed away peacefully at 12:25 this afternoon” at his home in Selsey, West Sussex, they said in a statement. Sir Patrick presented the BBC programme The Sky At Night for over 50 years, making him the longest-running host of the same television show ever. He wrote dozens of books on astronomy and his research was used by the US and the Russians in their space programmes. He had a brief appearance in Matt Smith’s first episode, The Eleventh Hour, playing himself and was mentioned in a 9th Doctor story. My sister and I met SIr Patrick at a fund raising for cats protection in his garden we had a toy table and sir Patrick bought a teddy for his godson we had our photo taken with him what a lovely man we treasure our photo with him he sadly missed Margaret and Maureen from pagham. RIP Patrick, i had the pleasure to meet him at his home in 2003 and he invited me in for a chat, he was a very interesting man and a true legend and i will miss you, gone but will never be forgotten. When I was a teenager you gave me inspiration and being able to watch your programmes gave me a chance I would never have had. Wonder if he’s being buried or cremated. If the latter I couldn’t think of a better posthumous honour than to have like Gene Roddenbery and James Doohan before him his ashes scattered by NASA into space. Rip Patrick. You made the world a better place, and I respect you very much for that. You are an angel now (note: not a weeping angel) and have gone to a better place. Good Bye, and may you rest in peace! I never heard of him until The Eleventh Hour, but R.I.P. Sir Patrick Moore. 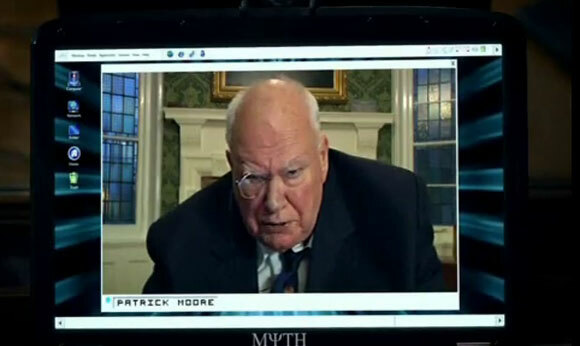 Sir Patrick Moore I harldy knew ye, but your work shall live on forever. RIP Sir Patrick Moore. You watched the stars in the Night Sky from doen here. Now you can watch them from up there. The world was a better place because of Sir Patrick Moore; he was an inspiration to all. God Bless. Sad to hear he’s died.